It was probably the Four Evangelists on fol. 27v that the twelfth-century chronicler Giraldus Cambrnsis was describing when he wrote of a book that “is the work of angelic, and not human” hands. 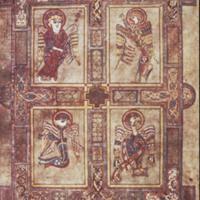 The Four Evangelists are represented by their unique symbols, a common practice used in Christian art. The upper left is an angel, the symbol of St. Matthew; the upper right is the lion, representing St. Mark; below it is the eagle, St. John’s symbol, and the bull is the symbol of St. Luke. 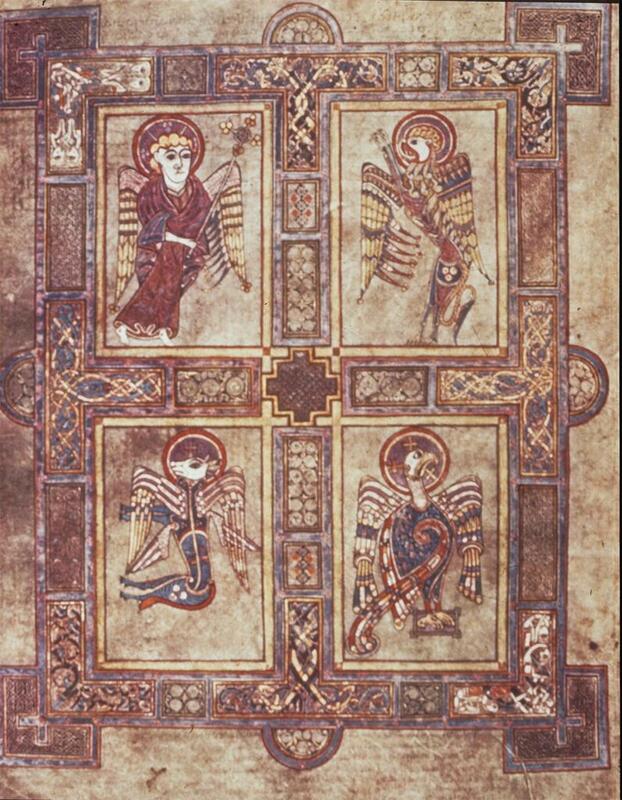 “Four Evangelists from The Book of Kells (9th century), from DRIS Trinity College Liberary Dublin IE TCD MS 58,” Medieval Hollywood, accessed April 24, 2019, http://medievalhollywood.ace.fordham.edu/items/show/79.